New York Jets quarterback 'Brett Favre takes time after the team's practice in Florham Park to sign an autograph for Storekeeper 1st Class Louis Lopez, a recruiter assigned to Navy Recruiting District New York. The Jets invited service members to the practice as part of their Military Appreciation Weekend. Brett Favre is a retired American football player. He played as a quarterback mostly for the Green Bay Packers of the NFL. He also played for the Atlanta Falcons, the New York Jets and the Minnesota Vikings. He has won the National Football League Most Valuable Player Award 3 consecutive times and the Super Bowl once. During his career, he had the nickname "The Gunslinger"! He is married to Deanna Tynes and they have 2 children. They together published a book in 2004, titled "Favre". He made a guest appearance in the film "There's Something About Mary" as Cameron Diaz's former lover! Created by user and released into the public domain. Master Chief Petty Officer of the Navy (MCPON) Joe R. Campa Jr. meets Brett Favre from the New York Jets during the coin toss on the field at the Meadowlands. The New York Jets took on the St. Louis Rams on Military Appreciation Day. w:Brett Favre warming up before a game. 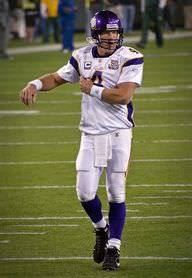 Brett Favre is a famous American football player, who was born on October 10, 1969. As a person born on this date, Brett Favre is listed in our database as the 6th most popular celebrity for the day (October 10) and the 50th most popular for the year (1969). People born on October 10 fall under the Zodiac sign of Libra, the Scales. Brett Favre is the 210th most popular Libra. Aside from information specific to Brett Favre's birthday, Brett Favre is the 1472nd most famous American and ranks 4th in famous people born in Gulfport, Mississippi, U.S. In general, Brett Favre ranks as the 2561st most popular famous person, and the 100th most popular footballer of all time. “The Famous Birthdays” catalogs over 25,000 famous people, everyone from actors to singers to scientists to serial killers and more. If you're curious to see who was born on your birthday, you can use our database to find out who, what, where, when and why. You can search by birthday, birthplace, claim to fame or any other information by typing in the search box, or simply browse our site by selecting the month, the day, the horoscope, or any other clickable option. 4th born in Gulfport, Mississippi, U.S.